Minestrone soup needs a bit of love and attention – but once everything is in the pot, it pretty much takes care of itself. It definitely improves when left alone for a while before you tuck in. In fact, it tastes even better the following day. 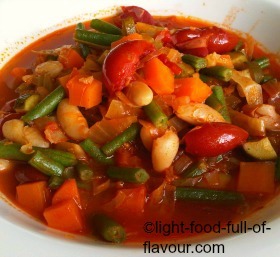 There are many different recipes for minestrone soup. Some recipes are quicker to make but I follow the lead of an Italian recipe that advice a long simmering time. The result is a filling and stunningly tasty soup. 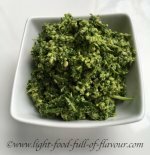 It can be eaten as a vegetarian version or with meat. I add the rind of a Parmesan cheese when cooking it, and love to eat it with either crumbled feta cheese or grated Parmesan cheese and cooked chicken. I also add nutritious beans – a much better choice than adding refined white pasta or rice as both of these are lacking a lot vitamins and minerals. And if you want to lose weight, you are much better off adding beans to the soup and avoiding white rice and pasta. 1. Place the oil a large pot over a low - medium heat and add the onion and garlic to the pot. Cook for about 10 minutes – stirring frequently to avoid burning the vegetables – until the onion is soft. 2. Add the carrots, celery, cabbage and zucchinis to the pot. Stir and cook for a minute. Add the tomatoes with their juice - breaking up the tomatoes if using whole plum tomatoes – stock, herbs, salt and pepper. Stir and bring to a simmer. 3. Cover the pot with a lid, turn down the heat and allow the soup to simmer over a low heat for about 1 hour and 45 minutes – give the soup a stir a couple of times during this time. 4. Add the cannellini beans and green beans to the pot. Stir and re-cover the pot with the lid. Cook for a further 15 minutes. If you are using frozen peas, add them a couple of minutes before the soup is ready. 5. Remove the Parmesan rind from the soup and check the seasoning. Serve it with grated Parmesan cheese or crumbled feta cheese.